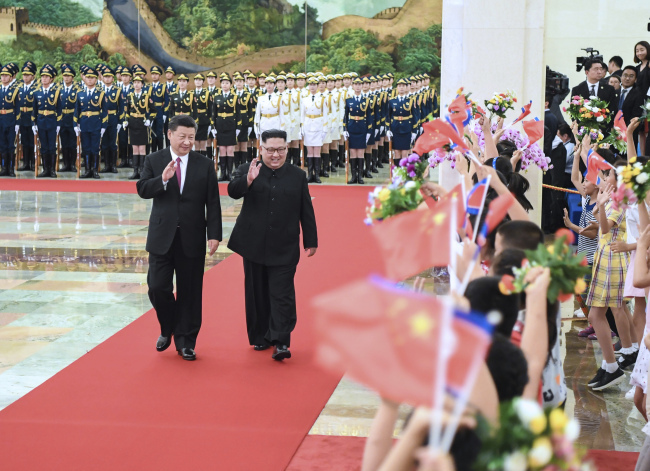 North Korean leader Kim Jong-un wrapped up his four-day visit to China on Wednesday after holding talks with Chinese President Xi Jinping and touring an economic zone, while the US maintains its silence over the two leaders’ meeting. Kim’s train departed from a train station in Beijing at around 2 p.m. after Kim and Xi had lunch together, according to Yonhap News Agency. Given that it takes more than 14 hours from Beijing to the border city of Dandong by train, Kim stayed less than two days in the capital city. In the morning, Kim visited Tong Ren Tang, located in an economic-technological development zone in Beijing, which is the largest producer of traditional Chinese medicine. The North Korea leader, who stressed that attaining economic self-sufficiency and prosperity is the country’s core drive in his New Year’s address, spent some 30 minutes there inspecting production sites, which could be a model for North Korea in modernizing its herbal medicine industry. Beijing’s only state-level economic area is home to more than 4,600 electronics, IT, biopharmaceuticals and transport equipment companies. On Tuesday, Kim and Chinese President Xi Jinping met for about an hour to discuss the looming North Korea-US summit, which is expected to take place this month or next. Xi and first lady Peng Liyuan later hosted a dinner for Kim and his wife Ri Sol-ju at Beijing’s Great Hall of the People, which lasted four hours. State media outlets in China and North Korea, in an unusual move, announced Kim’s trip in advance, as a train carrying the North Korean leader and his entourage of senior officials crossed into China. But they had yet to report on the content of the two leaders’ talks as of Wednesday afternoon. The US administration has been keeping mum on the visit as well. US President Donald Trump, who often comments on diplomatic issues and his accomplishments via Twitter, had not mentioned the summit between Kim and Xi as of Wednesday. Each time Kim visited China last year, US Secretary of State Mike Pompeo traveled to Pyongyang shortly afterward, but the US official seems to have no similar plan this time. “On Secretary Pompeo’s visit to North Korea, we don’t have any travel to announce at all,” US State Department spokesperson Katina Adams said in response to Radio Free Asia’s request for comment Tuesday. Analysts here said the North Korean leader is seeking to strengthen its negotiating position by aligning the country and China ahead of his meeting with Trump. “The US is translating Kim’s trip to China as (part of) a war of nerves. Kim also made the visit as a gesture that he wouldn’t beg for an early North Korea-US summit,” said Cha Du-hyeogn, a visiting scholar at Seoul’s Asan Institute for Policy Studies. Trump and Kim reached an agreement to work toward the “complete denuclearization of the Korean Peninsula,” during their first meeting in June in Singapore. But talks have since stalled over disagreements about how to accomplish that. The US is refraining from negative comments on Kim’s trip because China has been tough on the enforcement of UN sanctions against North Korea and trade talks with Beijing are going smoothly, said Kim Hyun-wook, a professor at the Korea National Diplomatic Academy. “The relations between China and the US have changed from how it was when Kim and Xi met last year. North Korea’s trade with China has been significantly reduced in 2018 compared to the year before. This means that China implemented the UN resolution well,” he said. Kim added that the ongoing US-China trade talks seem to be Trump’s priority more than any other issue at the moment.